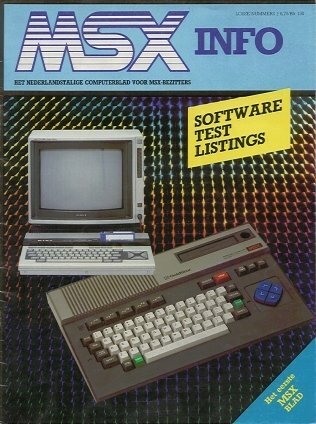 This is the cover of the first issue of the first official dutch MSX magazine. The chief-editor and publisher had close connections to Japan and he could therefor publish a lot of info and photo's from the land of the rising MSX. For instance, he knew Kay Nishi, the 'father' of MSX, personally! This issue (published in 1985) has 36 pages filled mainly with general information about the MSX standard and the first MSX's. The price was then NLG 6,75 (about US$3.50). When I look at a more recent issue (No. 4 of the 4th year, 1988) I see a small pricerise. That issue costed NLG 7,95 (about US$4) but had almost double (68) the amount of pages! The cover features the Goldstar FC-200 and the Sony HB-55P.